Nearly two months now on with wireless broadband, after 13 years of really slow dialup, the speed is still a novelty. The service has been faultlessly dependable so far, with no outages or other problems with the network. We'll see how things go in a Nova Scotia winter's snows and ice storms. The only problematical aspect has been not with the network or the Belkin wireless router, but rather with increasingly erratic and ragged performance when connected with my old Pismo PowerBook via a Buffalo WiFi CardBus adapter and AirPort running under Mac OS X 10.4.11. For the first couple of weeks back in September, this setup worked well, but currently it's gotten so bad as to be unusable. The connection just drops out for no apparent reason, sometimes spontaneously restoring itself - but usually not. Dialup (I've maintained a minimal dialup service) still works as well as it ever has, but the wireless LAN, which works superbly with my Unibody MacBook and 17" PowerBook G4, is a washout with the Pismo so far. I've tried the usual easy stuff like running system maintenance routines with OnyX, and even applied the OS X 10.4.11 Combo installer again, but no joy. I suppose a clean system reinstall would be worth a shot, and I may try that next experimentally on an external FireWire drive, but I've been ultra busy lately and haven't been able to fit it in. I prefer using the Pismo for drafting and editing away from my office workstation, but the wireless connectivity problem has me stymied, so the alternative for now is to use the big 17-incher. That has other advantages, such as support for OS X 10.5 "Leopard", but as I've related here previously, I absolutely detest the AlBook's trackpad - and it doesn't seem to like me much either. It's too bad, because otherwise the 1.33 GHz G4 unit is a pleasure to use (albeit a bit heavy). One workaround I tried was a Logitech Cordless TrackMan Wheel thumb-actuated trackball, the rationale being that a trackball made sense for this sort of service, in conjunction with a Laptop LaidBack stand on beds and couches, because it could remain stationary and didn't require a mousing surface. 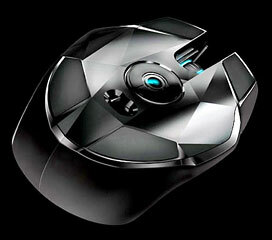 It did work pretty well, but I never really acclimatized to the thumb trackball to the point where it became intuitive. However, this past week I've been using an Razer Orochi mobile gaming mouse, which I'm testing for a review, and finding it to be a much more satisfactory solution than the trackball, notwithstanding the need for a mousing surface. I dug out an old rigid mousepad platform by Contour Design that I'd never used much, but it's turned out to be very useful in this context. The Orochi is a very satisfying rodent to use. It's also spectacular-looking, in a Darth Vader-ish way. The Orochi, which is designed specifically for use with laptops and comes with a protective carry-case, although it would make a fine desktop mouse as well, is an ambidextrous unit that supports both Bluetooth wireless or hard-wired USB connectivity - the latter via the best-looking and most elegant USB cable I've ever seen: lightweight, extremely flexible, and covered with a black braided fabric-like texture. It plugs into a port at the mouse end hidden below the scroll wheel - gold-plated no less - and is a generous three feet in length. This multimode flexibility is a great idea. For use in desktop mode, I would generally lean toward wired mode, but for portable use, wireless is very convenient, and happily the Razer Orochi mouse has manifested none of the latency lag that afflicts some Bluetooth mice. Indeed, it is extremely responsive, thanks presumably to its high-resolution 4000 dpi 3G laser sensor (five times greater than of standard 800 dpi optical sensors) that offers speedy tracking up to 100 inches per second. That drops to 2000 dpi sensitivity when used with a Bluetooth connection, and Razer says in order for the mouse to deliver gaming grade precision, control, and accuracy, you want to go with a hard-wired connection, although it's the most precise-feeling Bluetooth mouse I've ever used. It also still takes several seconds to reconnect after the PowerBook has been wakened from sleep mode, which I find tedious, as Razer recommends switching the mouse off when not in use to extend battery life, which requires a short wait for reconnection, but otherwise it works extremely well. Being designed for gaming, the Orochi has four oversized and very low drag zero-acoustic ultraslick Teflon™ glide pads, which provide slick and effortless tracking. 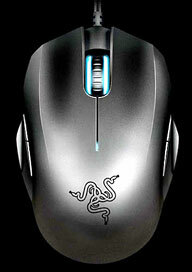 In fact, it's so low-friction that if the Contour mousepad isn't level, the mouse easily slides off due to gravity. It's not a super-light mouse, being as it carries two AA cells when used in Bluetooth mode, but it's definitely not heavy, weighing in at 21 grams less on my postage scale than my slightly physically smaller Logitech V550 wireless laptop mouse, which also carries two AA batteries. Few, if any, mice I've ever used track more effortlessly than the Orochi, and it's It's a nice size (smaller than some of Razer's other gaming mice, but not a mini-mouse by any means), has a comfortable feel and good positive yet light button action. My only real criticism is that the detents on the scroll wheel are too pronounced and there's no freewheel option for the wheel. That latter issue had me pondering giving the Orochi Mouse a 3.75 out of 4 rating, but I'm so pleased with how this mouse has addressed my pointing input problem with the 17" PowerBook that I'm going to give it a full 4 out of 4. It's really a pleasure to use. 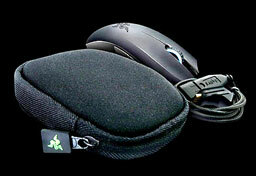 The Razer Orochi mouse requires Mac OS X 10.4 and later or Windows XP and later. 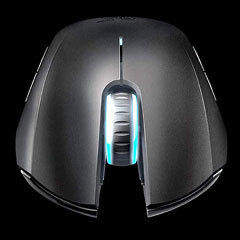 It retails for $79.99, which is at the high end for computer mice these days, but this is a very high-quality, advanced engineering mouse. 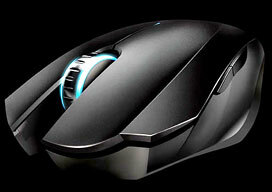 In general, even though I'm not a gamer myself, I often find gaming gear the cream of the crop for general use as well.